It’s not that Garcia’s restaurant, which opened on Flower Street in late June, is a temple of purism. A chef who spent six years cooking Cal-Med cuisine at Fig, the Fairmont Miramar Hotel’s restaurant, the 37-year-old isn’t reluctant to strain classic Mexican dishes through a distinctively L.A. filter. He adds thin sea beans and fig slices to an appetizer of crumbly requesón cheese, a ribbon of agave syrup drawing out flavors and tying them together. He serves a single Madagascar shrimp, cooked a la plancha, with seared pineapple cubes and a dab of harissa made with pequin and cascabel chiles. 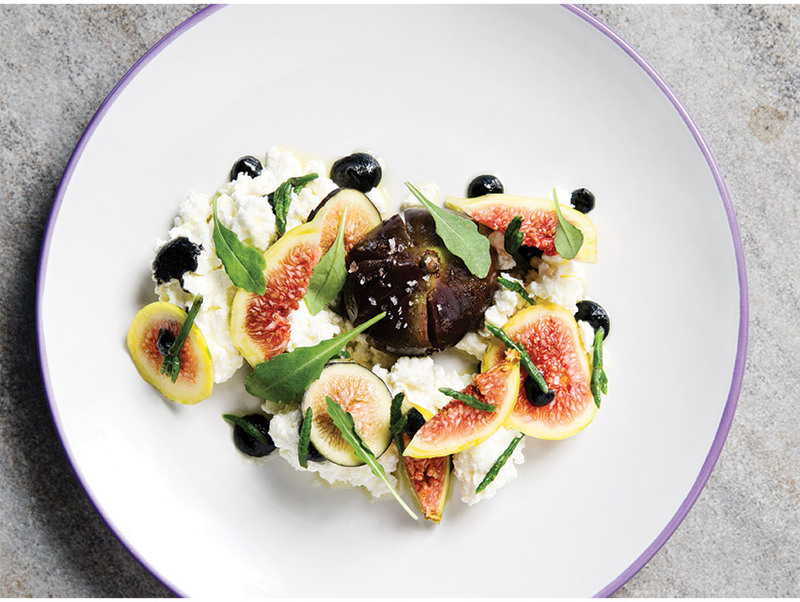 Peach wedges and a few arugula leaves brighten moronga, a dense blood sausage he crafts as a terrine. 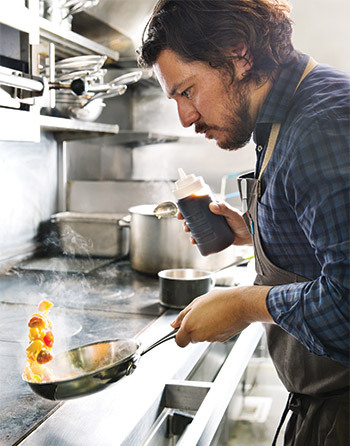 What becomes clear as dish follows dish is that even when Garcia mixes high and low or the traditional with the new, he is gunning for his own kind of genuineness rather than just a stolid hybrid. He’s being true to a heritage regardless of whether that means ruffling expectations. You can’t order guac and chips; Garcia figures folks can get them across the street at El Cholo or Rosa Mexicano. Nor does bottled hot sauce adorn the tables; seeing someone splashing it on molletes—a toast freighted with smashed peas and scattered panela—would probably cause Garcia to wince like a sushi master who’s spotted a customer drowning hamachi in soy. Instead he offers heirloom corn tortillas with a bowl of pureed lentils that hint at refried pintos. For the camote he cooks an Okinawa sweet potato in piloncillo sugar syrup until its skin splits. Over the tuber go braising juices packed with pig tail, snout, and ear, a meaty mass he sharpens with verjus, the must of unripe grapes. Playing off classic mixiote, Garcia drapes rabbit leg with stewed cactus paddles in a broth kindled with chipotle heat. Where other chefs might cook the dish in aluminum foil to re-create the pit technique, he uses food-grade cellophane, creating a large beggar’s purse that you have to untie at the table. Using a new-age material to update an ancient technique is the sort of flourish that would make me wince if the flavors didn’t ring so true. Garcia pushed that note of irreverence further at the storefront spot he opened in April a mile away on 7th Street, giving it the name B.S. Taqueria and thereby beating to the punch the people he guessed wouldn’t be OK with the idea of a clam and lardo taco. It’s a pretty good dish—the finely chopped pork fat swirled into a salsa and melting over the warm bivalves—that fits the energetic space, which vibrates with bold colors and serape cushions. The short menu hews to street food. There are crisp duritos—those orange puffed-wheat wagon wheels you see in bags dangling from vendors’ carts—and crackling oil-fried churros. Drizzled with gua-jillo butter and splashed with lime, the grilled corn on the cob is far better than the bowl of esquites, tepid corn kernels drenched in kewpie mayo, at Broken Spanish. Backing both places is restaurateur Bill Chait. 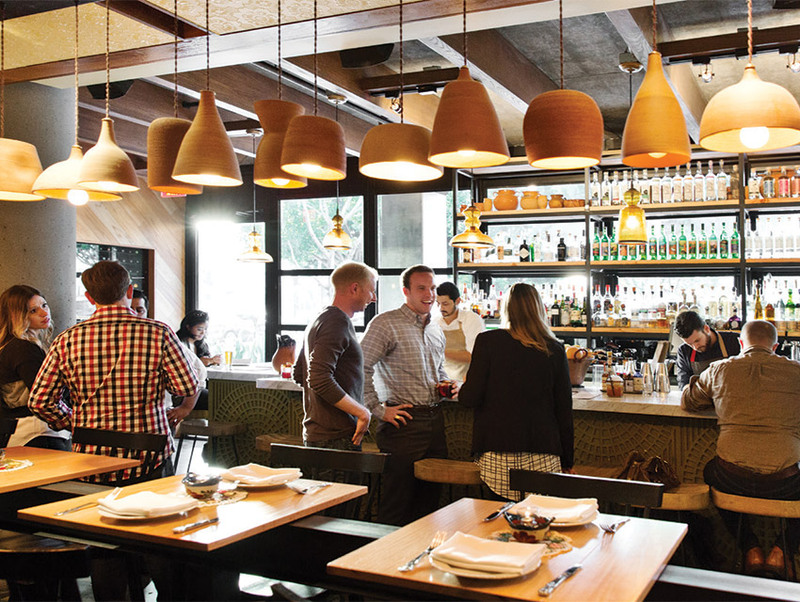 He helped install the taquería in the space that Ricardo Zarate’s Peruvian hang Mo-Chica once occupied; Broken Spanish touched down at the address that belonged to Rivera, the ambitious pan-Latin venture that was the vision of chef John Sedlar. Running the length of the Lofts building, Broken Spanish is laid out with three eating areas that follow one another like train cars trailing the chugging locomotive that is the kitchen. Interior decorating firm Bells & Whistles has opened the space by lining the front room with the midcentury concrete-screen blocks you might see surrounding the yard of a ranch house. Clay shades on the pendant lights by the bar tables evoke planters, while photographs of the staff’s relatives and a glass-fronted hutch add to the intimacy in another part of the restaurant. That sounded about right. Garcia is part of a vital conversation going on these days as Mexican American chefs have begun to reflect their layered experience in what they cook. Mexico City-born Jimmy Shaw combines the sizzling bacon-wrapped hot dog with an artisan telera roll at his downtown Torta Company. Ricardo Diaz can devote the menu to home-style braises at his Guisados chain—figuring out vegan options for those who request them—and still serve mole fries Tommy’s-style at Bizarra Capital in Whittier. The same kind of fluency is what makes Guerrilla Tacos founder Wes Avila’s duck liver taco so mind-blowing, binding gastronomic luxury with the urgency of peppers charred on a propane-fired grill. Like Avila, who was working under Gary Menes at the Le Comptoir pop-up when he launched his truck, Garcia had to fit the personal into the professional in order to find his voice. He is from Cypress Park, a neighborhood bordered by the L.A. River, the 5, and the 110. While pursuing a poli-sci degree at UCLA, he had a Japanese American roommate whose parents owned a sushi restaurant; that was the first time he tasted food different from anything he’d known. Scratching the plan to study law, he did a stint at culinary school in Pasadena. Learning under Bill Bracken at the Peninsula Beverly Hills gave him the confidence to land the job at Fig. Now he’s reached a juncture where he can discreetly blend the private realm into his dishes. His green beans, rather than being professionally crisp, are braised so that they’re as squishable as the poached egg and the sofrito he crowns them with. He takes pan dulce, an airy bread, and covers it with foie gras butter and a dusting of pilon-cillo. The slice has room for improvement (too much butter and not enough foie gras), but what’s neat is how a classic ingredient is used in a new way, perhaps introducing itself with a wink to a client who grew up eating a rebanada for a school-day breakfast. I sense the same hominess in his enchiladas: two stacked tortillas with a cream of roasted pepper rajas and diced squash between them, the whole bathed in a cumin-tinged eggplant sauce. It’s as lush as a layer cake yet wonderfully simple. That kind of cooking has an underlying generosity in how it shares a backstory without announcing it. For the Abuelita hot chocolate, Garcia comes right out with a direct homage to the Nestlé brand whose solid pucks are a staple of paper-lined cupboards. But he’s riffing on it all the way. The “chocolate” is a broth of candied cocoa nibs; the ancho chile devil’s food cake is iced with 67 percent cacao Ecuadorian Alpaco ganache. As the waiter pours the liquid over the solid, the flavors seem to rise from the bowl—sweet, spicy, and suitably intense.